Alex Rieder, who scored Titans' first try. Photo: Scott Merrylees. Rotherham’s narrow and unlucky defeat is a setback to their hopes of reaching the promotion play offs. There are four Championship matches left in which the Titans can regain fourth place. But as a result of this loss to a club with a budget of £4m and fielding a side which included three British Lions, Rotherham have dropped to fifth in the Championship on 44 points - two fewer than Nottingham, fourth on 46. The East Midlands team and Rotherham clash next month in what is likely to decide which club reaches the top four and the play offs in May. Before then, Rotherham have a tough game at much-improved Moseley on Friday. 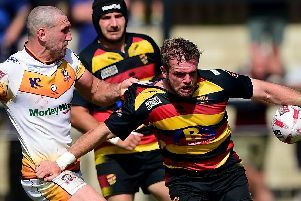 In a climax which few will forget on Saturday, fly half James McKinney had the chance to level with the last play of a richly entertaining encounter against one of the promotion favourites. With Bristol leading by only 27-25 after Rotherham had fought back to score three second half tries, McKinney, in the fifth minute of injury time, needed to convert his own try to seize a dramatic draw and with it two precious points for a share of the spoils. The Ulsterman had already put over two conversions and two penalties but his kick flew across the posts instead of through them. So, Rotherham, recovering strongly from 20-6 and then 27-13 down frustratingly earned just a losing bonus point - a poor return considering their commitment and the passion by the pack that set up tries of 65,70 and 85 minutes for forwards Alex Rieder, Ali Birch and McKinney. The turning point came on 69 minutes when Rotherham, who had defended solidly overall, gave away the softest of tries. Bristol’s fourth try was surely the easiest they’ve scored all season. After Matt Morgan’s penalty missed the posts, the ball bounced towards Rotherham’s defenders, but theyfailed to react and Bristol’s No 8 Mitch Eadie calmly collected the ball and touched down for the simplest of tries. Bristol now led by 14 points, but Rotherham’s forwards produced several exciting counter attacks which threatened to cause a major upset. McKinney’s try slashed Bristol’s lead to only two points and if his conversion had gone over, Rotherham would have achieved a deserved draw. “We showed character in both halves but the way we started both halves cost us and when we look back we’ll say we let this game slip”, said Titans coach Lee Blackett. Rotherham Titans: Scanlon, Keating, J. Davies, Cooke, Wilson, McKinney, White, Hislop, Cruse, Tampin, Maddison, Holmes, Rieder, Preece, Morris. Replacements: Dunn, Williams, Thiede, Ryan, Birch, A. Davies, Barrett. Rotherham scorers: Tries: Rieder, Birch, McKinney. Conversions: McKinney 2.Penalties: McKinney 2.